With such beautiful surroundings here in the Pacific Northwest– the majestic evergreens, mountains and streams– it’s no wonder why we love to have big windows in our homes, and lots of them. Large windows and spectacular views make a beautiful focal point in any home, but they can come with frustrations– and we’re not talking about window washing. The bigger and more prominent the windows are in your home, the more likely you are to have the glare of the sun ruin your view of your TV and computer screens. Sometimes all it takes in a small window in just the right spot to have you squinting. Couple that with a few mirrors, and the light in your home can be blinding. 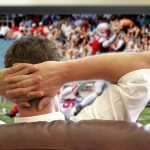 Most people love to have plenty of natural light in thier home, but when a big game is on, you end up closing all your window coverings and blocking out the light– and the view. Good news is, there’s an easy, win-win fix. With glare control window tinting, you can open your drapes and let the light in without having to rearrange your furniture. 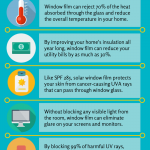 Panorama window films by SolarGard can reduce as much as 90% of sun glare, making it much easier to watch your television and use your computer. And, because Panorama window tinting comes in varying degrees of tint and light transmission, you’ll block out the glare and still be able to enjoy your view. Worried about your home looking like a limousine? We understand that many homeowners don’t want to have dark windows, fearing their view will be obstructed. This is a valid concern, and one of the reasons why Panorama offers glare reducing films in a variety of tint levels. The Slate Series, which is specifically designed for applications where glare is the primary concern, is available in five levels of reduced light transmission. The strongest Panorama Slate film will reduce heat and glare by 90 percent with a neutral tint that is hardly noticeable from the inside and provides a reflective finish on the outside. You can also opt for the baseline Slate Series film with a softer tint that will reduce light transmission by 50 percent, offering just enough privacy and glare control. When choosing a glare reducing film, we suggest going with the darkest film that you are comfortable with and we promise it won’t ruin your view. Think about it this way: lots of high quality sun glasses block as much as 95 percent of the visible light and we can still see with them on. These window films are no different! The key is finding a happy medium. We will help you find a film that will control the glare and keep the light levels just right. Additionally, many customers have other objectives when it comes to window films, such as heat control, privacy, and protecting furniture from fading. For these customers, Panorama offers multi-purpose films which will control glare as well as reduce heat transfer, block UV rays, and save your fabrics and furnishings. 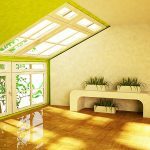 If you’re looking for a solution to the glare and other sunlight-related issues in your home, contact pacific window tinting today. Call 503-736-9000, or send us a quick message with our contact form.